GreatCollections is offering discount grading with PCGS and NGC. You can save as much as 60%, and you don’t have to consign coins after you learn about their grades. Check out the details by clicking here. GreatCollections offers collectors an extensive selection of certified coins ranging in price from $25 up to $10,000s. All coins have been professionally listed and imaged by GreatCollections expert staff and most are certified by the leading third-party grading companies including PCGS and NGC. Since GreatCollections has possession of all items being offered for sale, GreatCollections will ship your auction winnings and purchases to you securely and promptly. Sellers consign to GreatCollections to take advantage of our low commission rates, which work out in most cases to be cheaper than if they did all the work themselves. For the month of November, Great Collections is expanding its grading program, giving you the opportunity to have coins graded at discounted rates, even if you don’t wish to consign them to auction. Once the coins have been graded, we will contact you to see if you would like to auction or have the coins returned. This is valid for U.S. coins up to $20,000 in value. Crossovers and regrades welcome. Click here to download grading form. If you have any questions about consigning or what your coins are worth, please do not hesitate to contact us. 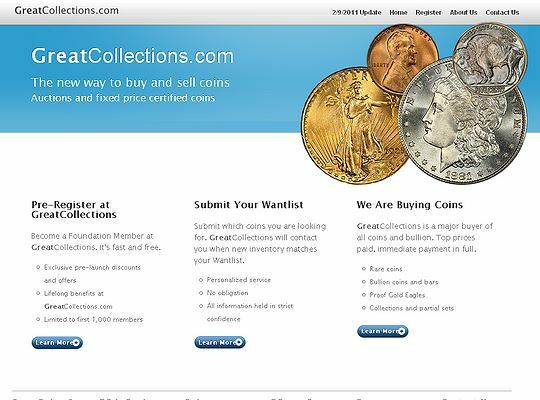 Telephone us at 1.800.44.COINS (+1.949.679.4180) or e-mail info@greatcollections.com. This entry was posted in The Block, Uncategorized and tagged GreatCollections. Bookmark the permalink.